You can contact us by phone during office hours or by email at any time. 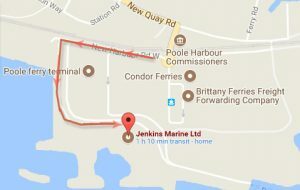 As you approach Poole, follow signs for RoRo passenger and cargo ferries and from there follow signs to Jenkins Marine. Just before the entrance to Poole Yacht Club turn left and follow the road as far as you can go (about 50m) and you will have arrived at Jenkins Marine. National Express operates a national coach service from the main bus terminal at Poole, which is about one mile from us. Poole’s main train station is about two hours from London’s Waterloo station and only about one mile from us. There are local airports at Bournemouth and Southampton, which fly to the more popular destinations in UK and Europe. Alternatively, Poole is between two and three hours drive from London’s Heathrow and Gatwick airports. Passenger ferries operate daily between Poole and Cherbourg, France. The ferry terminal in Poole is within walking distance of our offices.